I was working on an animated GIF image and found out some really heavy noise issues that results into heavy grains that is kind of like disturbing the motion sequence. The animated GIF image was all done on Photoshop, I manually created each of the 1200+ frames to make them, the result was just really disappointing, is there any help/solution we can do? The first one is just the first part I rendered from the whole part of the GIF. The second one is the whole part I made. As you can see, the first one has still some noise issues BUT it is really not that obvious to see but on the second one has some really huge grains that is surrounding all over the parts of the GIF. Is it something to do with the 256 color limit when saving for web in Ps? The graininess comes from the fact that animated GIFs have a limited color palette to work with and will use nearest-color substitution for colors that aren't in its saved palette, resulting in grainy and off-color images. Unlike JPEGs, which can have millions of colors, or vector images (which basically match any color you need), GIFs use anywhere from 2 to 256 colors in a stored palette to render an image. Your project has a wide range of color variations, I recommend that you to do your work in Flash or on Video. However, if you want to render your work on GIF here are some useful tips to achieve the best quality. 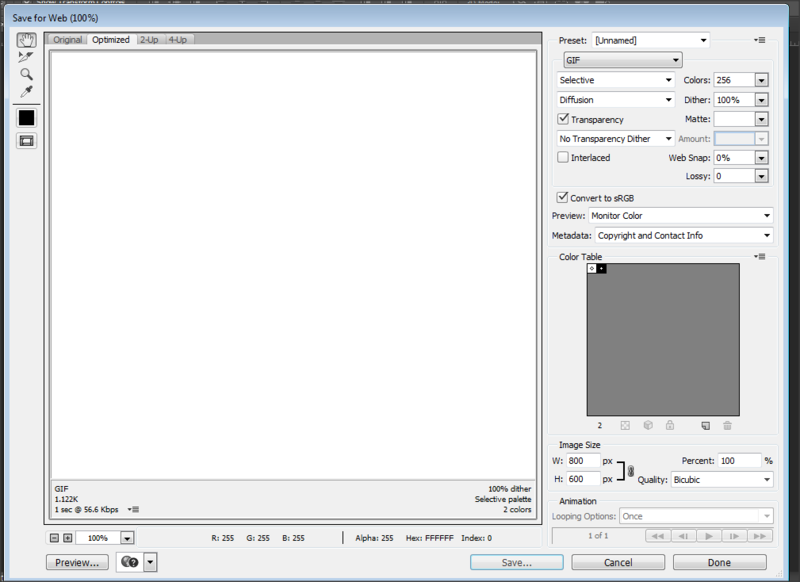 How to create & save a .gif without dithering with MS Paint? How to save a GIF with transparency without it creating white blobs around glow? Open for other solutions! How should I Turn an Animated Gif Trasparent? How can I delete border lines from a 2 frame gif in photoshop?